Today in Masonic History Johann von Robais, Baron de Kalb passes away in 1780. Johann von Robais, Baron de Kalb was a Bavarian-born French military officer. De Kalb was born in Hüttendorf, Bavaria near Erlangen. He would be commissioned in the Loewendal German Regiment of the French Army. He served during the Seven Years War and the war of Austrian Succession. In 1768, De Kalb traveled to America to determine the level of discontent on the part of the American colonists. During the trip he was inspired by the "spirit of independence" that he saw in the colonies. In 1777, De Kalb returned to the Americas, this time with his protégé the Marquis de Lafayette and the two joined the continental army. When De Kalb learned that he would not be made a major general he was very disturbed and decided to return to France. 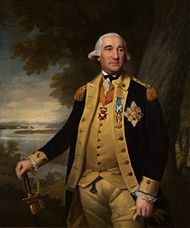 Lafayette used his influence to gain De Kalb the rank he sought. De Kalb was assigned to command a division of Maryland troops. He was sent south to the Carolina's as reinforcements for the troops already engaged with the British. He was disappointed again when on arriving in South Carolina when he learned that Horatio Gates would be in command instead of De Kalb. They would soon engage in the Battle of Camden which was a disastrous defeat for the continental army and Gates. During the Battle of Camden, De Kalb's horse was shot out from under him and before he could rise to his feet he was shot several times and stabbed multiple times with bayonets. It is claimed that Cornwallis himself supervised as De Kalb's wounds were cared for. On August 19th, 1780, De Kalb would die from his wounds. So, there lies the brave de Kalb. The generous stranger, who come from a distant land to fight our battles and to water with his blood the tree of liberty. Would to God he had lived to share its fruits! De Kalb was a member of Pennsylvania Lodge No. 29.